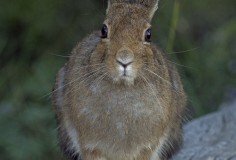 Snowshoe Hare Project Update: That’s a wrap! Hello Earth Rangers! I can’t believe it’s already been a whole year since we were first introduced. Time sure flies when you’re having fun! I’ve got my winter white coat on once again, and apparently I’d fit in just fine down there at Earth Rangers Headquarters, where it looks like you might even have more snow than we do up here! What do you mean I don’t blend in with the snow?! Speaking of fitting in, you’ll remember that my friend Michael was busy working on a project that looked at how climate change was affecting the survival of poor Snowshoe Hares like me. We stick out like a sore thumb to hungry predators when our coats don’t change as fast as the seasons, and Michael wanted to know just how much this camoufail was affecting our populations. 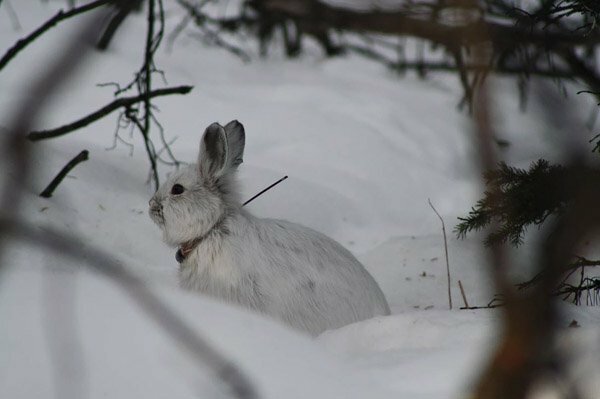 Michael has been doing this research since 2015, when he started monitoring Snowshoe Hares in the Yukon. He would record their coat colour and the amount of snow on the ground to see just how off the timing of the coat colour change was, and then he’d track the survival rate and behaviour of these hares to see how that affected them. Thanks to funds raised through your Bring Back the Wild campaigns, Michael was not only able to put together a team of technicians that went up to the Yukon to work on this important project with him, but he was also able to purchase monitoring equipment like radio collars (to track the hares) and accelerometers (to measure their movements) that really helped with his research. Awesome work, Earth Rangers! The team gathered a ton of interesting information, and they’re still hard at work trying to analyze it all, but they’ve got some pretty interesting results to share already! It looks like us hares are, as predicted, staying white well into the spring when the snow has melted, but surprisingly this didn’t seem to have much of an effect on the survival of the hares the team researched – and this is great news! 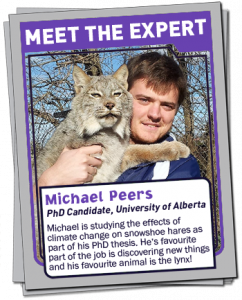 Michael thinks this might be because Snowshoe Hares are adapting by changing their behaviour to try and outsmart their predators (and I think this sounds about right – we’re a clever bunch! ), and he hopes that with more research and data analysis he’ll be able to get a better idea of just how they’re doing that. Check out my fancy new radiocollar! Well friends, it’s been quite a journey. It’s been so nice to have you tag along with me this year! Thank you again for your hard work – you’re making a real difference to me and to Snowshoe Hares everywhere! ‘Til next time, Earth Rangers!